Merely saying the name of the 7th planet in our solar system risks provoking adolescent snickers. Especially when you add a moon or two of… Uranus. There. 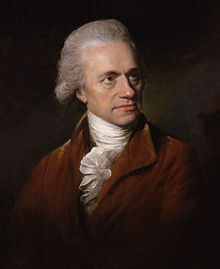 Now that we’ve disposed of that issue I’d like to raise a glass, carefully ground for optimum magnification, to William Herschel. He it was who first discovered that planet, the third-largest and fourth-heaviest in the Sol system, in 1781. Or rather, discovered that it was in fact a planet and not a comet or a star. Despite which he wanted to name it the "Georgian star" or "Georgian planet" which is only funny in a sad way as it was an obsequious attempt to curry favour with King George III. I guess it worked, in that the German-born Herschel was appointed "The King’s Astronomer" by the German-descended king a year later. But the French were so unwilling to utter the name of the British king (I don’t see why; it’s not as though they were stuck with him) that they called it "Herschel" until the name Uranus was adopted after a long and on the whole civil debate of exactly the sort we don’t now have on the Internet. And by many people in whose language it wasn’t a double entendre, I might add. If Uranus’ moons had been inhabited, perhaps we would have learned great scientific or cultural secrets from them. Like that the sun is extremely hot, say. Or that disinterested curiosity is a good thing. If they were even reachable, they might furnish thrill-seeking tourists with something special to do before you die like witness a methane waterfall. Right before you die, I mean. Still, I feel that Hershel more or less stared into space because it was there, and found weird celestial bodies because they were. (While not composing one of his 24 symphonies along with many other musical works, in case you want to feel inadequate.) And he went right on finding cool things in space, like that the ice caps on Mars change with the seasons, that our solar system is moving through space and so forth. And to do something periodically without a covetous eye on the outcome is a good thing. As for his securing career advancement through it, well, it just shows a society exhibiting disinterested curiosity. And there are many worse qualities.